It was crazy! I thought I’d be flying on a Boeing. Instead, United Airlines put me on Amtrak! In brief: I missed my long cross-country flight! Through no fault of my own. And other bad things sprang up, too. First, a Flash Back: For nearly 20 years I’ve been taking off to California for Christmas and to re-unite with milady Annabelle. She lives in a sunny place with no ice and no snow. Recently I sent you a post saying that I was all set for this big trip. Had booked my trip on tried and true United Airlines. Told you that my getting to California always involves three flights: a short flight to a major air hub, then the long flight across the country to California, then a short flight to San Luis Obisbo. My daughter Monique lives 15 miles north of there, in Morro Bay. But! My confirmation from United showed something totally surprising: my first leg was going to be not a flight, but a train ride on Amtrak! And this also surprised the people at Old Saybrook Amtrak—they had never heard of such an arrangement. Well, that Amtrak ride provided by United was from New Haven to Newark Airport. Amtrak stops there. But how would I get to New Haven from my Deep River? That’s a good one-hour ride. 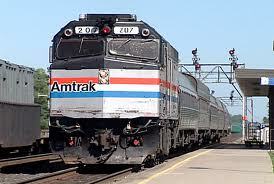 What turned out to be the easiest was to buy a ticket on that same Amtrak train from Old Saybrook to New Haven. That way I’d ride the train right to Newark Airport. On my departure morning, my friend Woody Boynton gave me a ride to the depot in Old Saybrook. That turned out to be the best thing that happened to me all day. The bad things were still to come. The train was already quite full. Every row of seats had at least one seat taken. So I chose a seat next to a small person. Success. I had a lot of stuff. I had to have a lot. I wasn’t going for 3 days. I was going for more than 3 months! So, I had a big suitcase jammed as full as United would accept without overcharge. Plus a big handbag also jammed full, and as big as I could squeeze into the plane’s overhead bin. Plus my laptop computer and many accessories jammed into its own shoulder bag. Furthermore, I was wearing a warm zippered vest and winter jacket and a hat. And I had my walking stick, which I need for any serious walking–this would take much serious walking! So I was loaded down. In New Haven, I stayed on the same train, of course. But the conductor had changed. He shook his head when I showed him my United confirmation. Was baffled. He pocketed the letter and said he would get back to me. He returned in 20 minutes and said I would not have to pay—he was satisfied the United Airlines confirmation was legitimate. Some people love riding a train. I’m happy for them. I’ve used trains a lot, in the U.S. and other countries. I can’t get excited. Tracks are laid out to be the most practical…meaning to avoid all hills. Not to show us the best views and give the most interesting ride. In cities, all you get to see are the worst neighborhoods…the backyards of the factories and warehouses, plus the backyards of houses in some of the worst neighborhoods. New York City is an example. Ride into New York City on a train and you get an awful impression. You’d say, “No way would I want to live there!” Well, that’s how I feel about it. And the backs of the seats are so high that you cannot see ahead. It’s awful. If you’re 6’6” tall, you can. But I’m not 6’6”. And I hate being boxed in that way. Plus, walking on a train in motion is dangerous! Much rocking and bumping even on an Amtrak com! There are times when you do have to walk and risk your life—to get to the toilet and the food car, and sometimes to get to an exit on the train. I’ll bet a surprising number of folks fall and hurt themselves in a year. In my opinion, inter-city buses are much better. More interesting. More comfortable. On a bus, looking through a window gives you a more representative view of the country you’re riding across. I’ve ridden Greyhound all the way across the country from the Atlantic to the Pacific three times, plus to other locales, plus nearly all the way across Canada. I favor Greyhound. It’s more of an adventure. It’s also cheaper, by the way. Finally we were approaching the Newark Airport stop. An announcement said, “Next stop in 3 minutes!” By now every seat was taken. Many were getting off here. Many leaped up while the train was rocking along. Began grabbing their suitcases and stuff. No way could I do that. I have a balance problem now—the result of going deaf in my right ear a year ago. I’d be nuts to dare stand before the train came to a dead halt. When it did stop, I got up. The aisle was jammed with people. I had a hard time retrieving all my stuff. My jacket was pushed far back on the rack above. I had to get a tall guy to reach up and take it down for me. Now everybody was pushing to get off the train. I was at the end of the long line, which was moving slowly. Just as I got to the door out the train, it closed! I tried and tried. No way could I get it to open. The train began rolling! I was frantic! My flight would be taking off in 1 hour and 40 minutes! Would I miss my flight to San Francisco? And my public talk in the morning? At 10:30 a.m., I was booked to give a long-arranged talk at the Morro Bay Public Library. It’s the hometown library of Monique and David. They had arranged the talk for me. I give such talks quite often. But a young woman had seen my plight. She ran to get the conductor. He wasn’t in our car. She rushed on to the next car. She came back and threw up her hands in frustration. Bless her! Finally he showed up. “We gave you a 3-minute notice!” he told me sternly. He looked irritated. I’m the one who should have looked irritated! “Get off at the next stop!” he told me. He ordered to to sit down. I had been standing with all my stuff by the vestibule, leaning into a corner to make sure I didn’t fall. The tracks always look nice and smooth and flat. You expect a nice smooth ride. Not so! “I’ll come back when we stop,“ he snapped. “I’ll tell you what to do then!” And he stormed off. I kept hoping the train would stop at any minute. I needed every minute to make my flight! It took a long time, whatever it was…10 minutes, 12 minutes. The conductor returned just in time…ushered me off. I had so much to carry. He pointed to an elevator 75 feet away….told me to take it down…then walk across to the other side of the tracks…take the elevator up…stop at the ticket office on that side and explain…then take the next train back to the Newark Airport stop. But how long would all that take? I did as he said. Walked to the elevator dragging all my stuff. Not easy. I was alone at the elevator. I pushed this button and that one. None of the buttons was marked. Finally the door opened and I got in with everything. Inside, 6 buttons! Maybe 8! I was so anxious it was hard for me to notice. Not one said “Down” or “Up.” I kept trying for the Down button. No luck. Unbelievable. I looked for help. No help around. I kept stabbing the buttons. This was crazy. I was losing precious time. Finally, finally I got the car to start Down! Somehow I got out. Dragged everything through the tunnel to the other side. Went to the elevator there. A woman was getting in. She held the door open for me, thank God. She pushed a button. We started Up. She did it all so easily it made me feel like a klutz. Up top, I dragged everything into the ticket office. Surprising I wasn’t having a heart attack. The clerk was busy with a customer. More time wasting! Finally I explained to her. She shook her head unbelievingly. Made me, 83 years old and going on too soon to 84, feel like a naughty kid. Handed me a complimentary ticket. Big mistake! This was not a through train! This was a local! I had two more stops to go! What!!! No choice. More precious minutes drained by. Finally the next train pulled up. It, too, was a local, of course, so slower. I struggled and got on. I kept thinking, What’s the use of continuing this mad rush? No way would I make my flight. But I had to try! A young woman had noticed my difficulties. And my anxiety. She was getting off at the airport, too. She had one suitcase of her own to handle plus a giant handbag. But she insisted on taking my big suitcase in hand. God bless her! She was no Amazon. Anything but. But at our stop, she hopped off. So nimble! With all that stuff! I had to be extra careful. Embarrassing. On the platform, she said, “Let’s go! Let’s go !” I followed her as fast as I could without breaking my neck. She led the way into the big station. Found an Amtrak guy and explained my problem. “That way!” he said, pointing. She steamed ahead. I struggled to keep up. At one point I was 15 steps behind. Then 30. She kept looking back. Realized I was trying hard. Then we entered the terminal She led me right into the huge airport terminal. She asked for directions. Led the way to an airport train. It rides a long circuit from gate to gate. No driver on board. All automatic. We had to wait for it. I asked her about herself. She had a foreign accent. I tried to guess what it was. Couldn’t. She was sweet. Told me she was a Ph.D. student in mechanical engineering at Rutgers University. Had won a scholarship of some kind. Mechanical engineering! She looked so feminine. The world IS changing. She was from Turkey—Istanbul! She told me that very proudly. I understood. I’ve been to Istanbul. Such a grand city. Unforgettable. I mentioned the Blue Mosque. The Grand Bazaar. Istanbul—the exact midpoint between Europe and Asia! She smiled appreciatively. She was pleased by my enthusiasm. Besides all that, this was a very happy day for her. She was ao excited. She was about to meet her mother. For the first time in nearly a year! It had been a long time for her. Now she found a United official for me. A woman. I rushed through an account of my miserable story for us. She wasn’t the least bit flustered. She had heard every possible crazy story, I was sure. She asked me for some specifics, typed on her computer, peered on the screen. She didn’t make any comment. But I was sure the news wasn’t good. She took me hand and put me on the train when it glided in. Told me where to get off. “Don’t miss your stop!” she told me pointedly. I couldn’t help noticing her emphasis. My Good Samaritan lady engineer patted me on the shoulder. “Now you will be all right!” she told me sweetly. “Merry Christmas!” And turned to head on. I stopped her, “”Thank you, Miss! Thank you!” And gave her a peck on the cheek. She laughed. I could see she was pleased. She gave me a pat on the shoulder. And took off. I was sorry to see her go. Really was. I stepped on the train. Was lucky and got a seat. The doors closed. The train slid ahead. I didn’t miss my stop this time. I was right by a United counter. Went to a clerk. She studied her computer. Finally she said, “I have another flight for you. It’s to Los Angeles rather than San Francisco. Then a short flight north to San Luis Obispo. Not south, as would have been the case on your previous itinerary. You will get San Luis 2 hours and 10 minutes later.” She smiled. I thanked her profusely.To myself, I thought, “It’s going to be a very short night!” And I had another urgent matter. I had to call Monique and David and tell them about this screw-up. And my new arrival time. I have no cell phone. “No problem!” she said and placed the call for me. In a minute she said. “Your son-in-law is on the line.” And gave me the call. I explained to David. He took it calmly. “No problem, John! We’ll be there to meet you!” he said. “Relax!” What a huge sigh of relief I let out. The lady agent wasn’t finished. She insisted on walking me to the long United desk. Placed me in the shortest line. Got me signed in and my big suitcase checked. Then summoned a wheel chair for me. As proud as I am, I did not decline. I was bushed. She told me where to sit and wait and wished me good luck. I thanked her profusely. She deserved profuse thanks! In eight minutes a big cheerful gal in uniform rolled up with a chair for me. I gladly got in. She took charge of my handbag, my computer, my walking stick, my coat, everything, and began pushing me. Fast. “Where to now?’ I asked. “To Security!” She didn’t waste a minute. Double-timed! I was puzzled. Why Security? Didn’t pursue it. She worked me into the check-in area. Long lines waiting. She bypassed them all. Pushed me right to the head of the line at the far left. . Then into a special lane. Only two people ahead of me. Helped me get all my stuff into the plastic buses and onto the moving conveyor belt. But I did not have to take off my shoes. Hurray! It’s a new rule for older people. A TSA agent ushered me through. Frisked me. Made me stand in a glass chamber. Ordered me to place my feet on two specific spots on the floor. Told me to hold my hands straight up. Stare straight ahead. I heard a click. Heard someone say, “Okay, sir. Now step ahead, please!” I completed the whole miserable process. Began gathering all my stuff on the other side. But my attendant with the wheel chair had followed me through. “No time to waste!” she snapped. “Please sit down.” She took charge of all my stuff. She rolled me right down the long ramp. Right to the door of the plane. Now I realized the flight the flight was being held for me. Gosh! I got on. But not without taking a minute to dig into my wallet and give that hard-working gal something for her strenuous efforts. The plane was jammed full. It turned out I was in a row of three seats. The flight attendant led me to my row half way back. Only the middle seat was available. The awful middle seat! A heavy woman was ensconced in the aisle seat. Instantly the attendant ordered her to move to the middle seat. What’s this, I wondered? Well, the heavy lady had thought only two of the seats in the row would be occupied.Her ticket was for the middle seat. It was nearly take-off time. So she had eased herself into the better aisle seat. Hey, I would have done the same thing. Very reluctantly she shifted over. I settled into the aisle seat and got settled. We took off. Every seat had a TV monitor. Once up at flight altitude, ! turned on a movie. I needed to relax! Something called “The Campaign.” A silly, crazy comedy but with a serious theme. Two men campaigning for a seat in Congress. A long-experienced Congressman very slick and sleazy whose guiding principle was to win re-election at any cost, meaning to use any underhanded strategy he thought would help him. And a nice guy, ordinary looking in every way, but a family man with a loving wife and kids, who was running because he felt Washington was a mess and he wanted to help the people in his district. Loved the movie. Then my screen went dead. An attendant came, studied, tried to reboot it. My TV remained dead all the way across. Every other TV on the plane kept working fine. The crew served us a beverage. Period. Not even the usual bag of peanuts. Then later they came around with cups of water.That’s typical airline service today, as we know. It was ominous. Scary. Dead silence on the plane. We waited for the awful bouncing to start. And waited. Braced ourselves. !t was a false alarm. Maybe the pilot circled around the heavy winds. Not sure. Felt no turbulence of any kind. And we landed in San Francisco right on time Amazing. Now I had a 50-minute wait for my next flight. I parked all my hand stuff. With my walking stick, I spent the whole time walking a circle around the gate area I was in. Around and around. Needed the exercise..
By magic, another wheelchair attendant approached. Insisted I be seated. Rolled me down one flight on an elevator and out the rear of the terminal. Right onto the blacktop where the planes were parked. Dark out night. And cold out! Br-r-r-r! Rolled me out to a much smaller plane a hundred yards away. It had only two engines. A turbo-prop , it looked like. Pushed me right to the base of the rolling stair that led up into the plane. I made it up to the top and in. Nice and warm inside. Good. Just 40 seats at the most, I’d say. I was the first on. I took a seat right by a window. I knew we’d be flying up the coast. I wanted to look down on the coast, not out on the vast, empty Pacific. Another 15 or 20 passengers got on. One engine sputtered on, then the second, and we took off. This was real flying–not the smooth, predictable, so powerful take-off of the big jets. This plane was surging and bucking and fighting its way up. Which I happen to enjoy. You knew the captain did not have this plane on automatic—which I know the big planes use routinely once they’re aloft. Maybe even on takeoffs? That for sure he had his hands on the yoke and was really steering this thing and bossing it. I had chosen the good side. It was a clear, beautiful evening, with a perfect quarter moon. I enjoyed the the lights in cities and towns along the shore, with the long dark stretches in between. And the lights of ships and boats making their way below. The hour went by quickly, and the pleasure of this brief flight made up for the boredom of my long flight across the whole U.S.A.
We landed on time. I managed the long walk into the terminal and up to the main floor. Monique and David were there waiting. Big smiles and open arms. A nice ride home. It was nearly 2 a.m. by Connecticut time when I got to bed—and I had gotten up at 5 a.m. I had been up 21 hours. But I managed a solid seven hours of good sleep and got up to a good breakfast and a nice, sunny day.. And I made my speaking engagement at the library the next morning. Which went well. If United Airlines ever offers me another ticket starting with a train ride, I’ll think six times before I accept it. You be cautious, too!